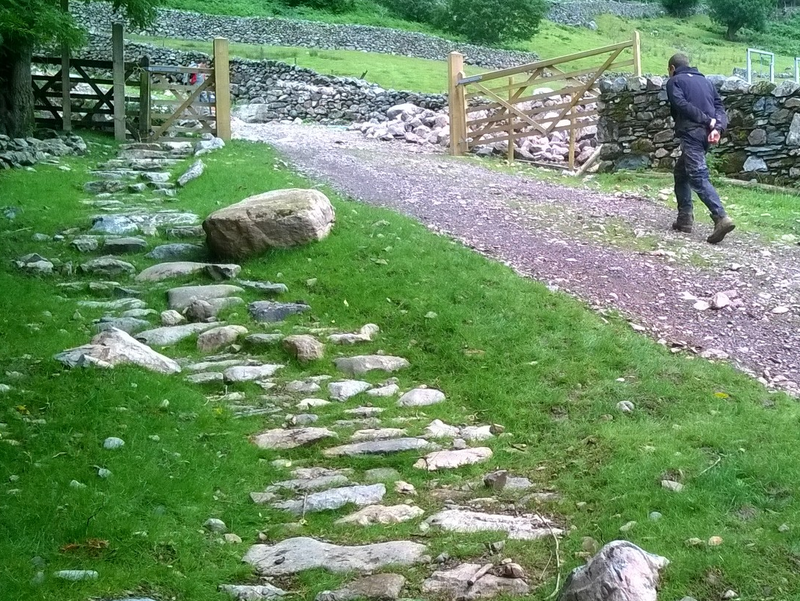 We've recently been working on a section of path next to Millbeck Farm in Great Langdale. The path had some old pitching around the gate but this was in need of replacing and much of the rest of the path had been disturbed during excavations for the new hydro project. The repairs were relatively straightforward except for a small section underneath a veteran Yew tree. To cause as little disturbance as possible to the tree we moved some large boulders into position to form the edge of the path. This meant we could raise the path over the roots and not have to dig through them. Luckily there was still a digger on site after the hydro work so we had the rocks in place much more quickly than if we'd had to move them by hand. In time as the Yew grows it's likely that we may have to reset some of the stones, so we'll keep a close watch on things. 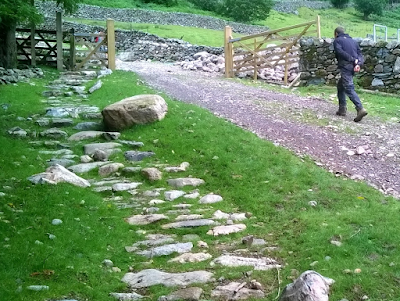 After a couple of weeks we'd replaced the path from beneath the Yew tree and up through the new gate. We brought in some extra topsoil that was being used for landscaping around the intake of the hydro-electric scheme and put some grass seed down, to give the path a good chance to recover. After just a few weeks time the new section of path was looking much improved.